So…this Weight Watchers thing? I’m doing it again. The nearly 35 pounds I lost 5 years ago? Came back as 40 pounds. It’s this never-ending battle, right? Good-evil. Salad-cookie. Head games. Sweat. Tears. More sweat. Lots of tears. It’s the reason for the paucity of #getinmahbelly recipes over the past few months. And also the reason for all-things-kale in this house too. 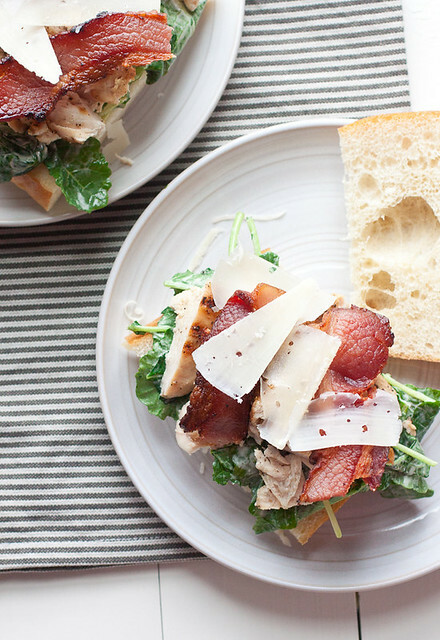 Like these grilled chicken and kale Caesar salad sandwiches with…erhm…bacon. You know what though? Bacon works on Weight Watchers. ONE piece of bacon works. And I’m okay with that. Because this sandwich was worth it. Piled high with baby kale gently tossed with a homemade lightened-up Caesar dressing, grilled chicken, and a slice of crispy applewood smoked bacon on fresh, chewy ciabatta? Heaven. I got the idea for kale Caesar salad from Annie and I haven’t been able to shake the concept since she posted about it last year. And once I got Kyle on board with swapping romaine out for kale in just about everything (including taco toppings! ), I knew this sandwich was imminent. We each polished off our sandwiches in no time flat and after a lunch filled with so much protein and fiber, we were both completely satisfied until dinner…when this happened with some bbq pulled pork. Nothing a long bike ride while watching Revenge and a few rounds of kettlebells can’t fix though! Heat the grill to high heat; once hot, reduce the heat to medium-high. Drizzle the chicken with olive oil and sprinkle a small pinch each of garlic powder, salt, and pepper on both sides of the chicken. Grill for 3-4 minutes per side until the internal temperature reaches 165 ° F. Remove the chicken from the grill and allow it to rest on a plate for 5 minutes. Slice into strips. Meanwhile, make the dressing. Pulse the garlic and parsley together in the bowl of a food processor until finely minced. Add the remaining ingredients and a couple cranks of black pepper to the bowl. Process until well blended. Toss the kale with half of the dressing, adding extra dressing if desired; set aside. (You can refrigerate any extra dressing for about 2 weeks.) Slice the ciabatta lengthwise through the center and then into 6 equal-size pieces. Top the bottoms of the bread with the dressed kale then add some chicken, bacon, and shaved or grated Parmesan cheese to each sandwich. Serve while the chicken is still warm. Grill the chicken: Heat the grill to high heat; once hot, reduce the heat to medium-high. Drizzle the chicken with olive oil and sprinkle a small pinch each of garlic powder, salt, and pepper on both sides of the chicken. Grill for 3-4 minutes per side until the internal temperature reaches 165 ° F. Remove the chicken from the grill and allow it to rest on a plate for 5 minutes. Slice into strips. Make the dressing: Pulse the garlic and parsley together in the bowl of a food processor until finely minced. Add the remaining ingredients and a couple cranks of black pepper to the bowl. Process until well blended. Assemble: Toss the kale with half of the dressing, adding extra dressing if desired; set aside. (You can refrigerate any extra dressing for about 2 weeks.) Slice the ciabatta lengthwise through the center and then into 6 equal-size pieces. 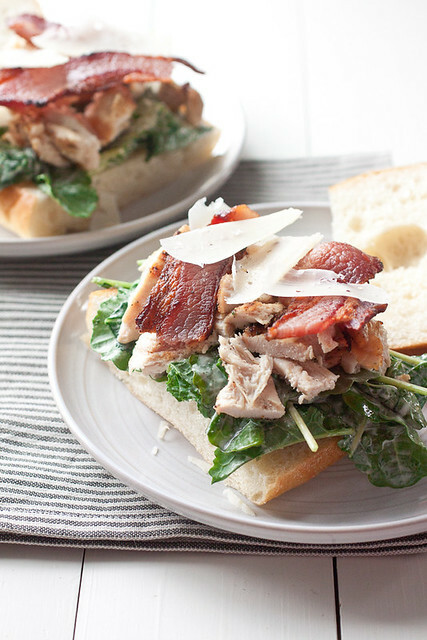 Top the bottoms of the bread with the dressed kale then add some chicken, bacon, and shaved or grated Parmesan cheese to each sandwich. Serve while the chicken is still warm. Boy, do I hear you……. loud and clear! I do always start out with good intentions, but then…..lookout…cupcakes!?! Yes, please, I’ll take two! This sandwich looks very tasty, plus it has kale, which I happen to like. I’m never one to completely give up, so healthy eating is on my plate again. It’s good to know I’m not alone – the battle is tough (yes, especially when there are cupcakes around) but it’s about forging on and keeping a positive attitude, isn’t it? Dear Girl, its disappointing, but be kind to yourself. I have done the same. You have a lot of sisters who are holding each other hands. On the positive side, hey hey this is a wonderful summer sandwich. I was doing some deck sitting this afternoon, admiring my handiwork in my garden and feeling virtuous that I had done it. This sandwich would have hit the spot. You’re welcome – great to hear that you loved it!